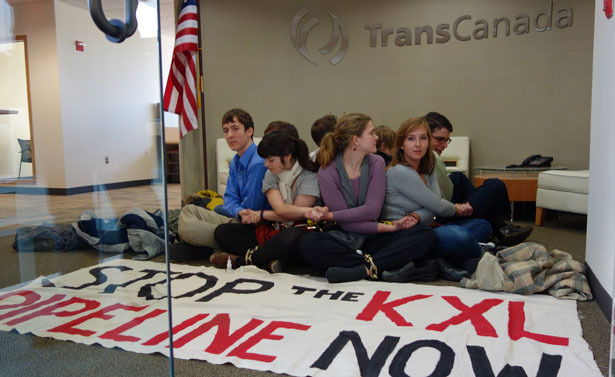 On January 7, I was arrested at the TransCanada Corporation’s office in Westborough, along with seven other youth climate-justice activists, in an act of nonviolent civil disobedience protesting the company’s proposed Keystone XL pipeline and its implications for the climate. As we sat locked in a circle in the TransCanada lobby, we represented the condition of our desperate generation, increasingly locked into climate disaster by the reckless and immoral business plans of the fossil fuel industry. If approved by President Obama, Keystone XL will run from the toxic “tar sands” of northern Alberta to the Gulf Coast—tapping a vast new store of carbon-heavy oil at precisely the time we need to speed the transition away from fossil fuels to prevent catastrophic global warming within our lifetimes. Almost exactly twenty years ago, I was born in Alberta, home of the toxic tar sands. My fight against Keystone XL resonates with my family’s history, but my fight for climate action resonates with my entire generation. The numbers of lives lost to the climate crisis have already been substantial, and my generation’s future is at grave risk as the crisis worsens. The solutions have long been clear, but our elected officials have failed for years—more years than I’ve been alive—to prevent fossil fuel corporations from sacrificing our future in order to maximize their short-term profits. According to the International Energy Agency’s 2012 World Energy Outlook, at least two-thirds of known fossil fuel reserves must be left in the ground between now and 2050, if we’re going to have a chance of avoiding climate catastrophe. The industry must therefore dramatically revise its business plan, as it cannot possibly expect to burn all those carbon reserves. For that to happen, we’ll need a political and social transformation. Our institutions—governments, universities, corporations—will need to be guided by ethics rather than greed. Our governments and universities must do everything in their power to hold fossil fuel corporations accountable, and ensure that they assist the transition to a clean-energy economy. If they do not, my generation will use the power of our numbers to prevent them from burning those reserves that would destroy our future. The climate crisis has no borders, and the fossil fuel industry will find no borders to our nonviolent resistance. While the eight of us were locking ourselves in TransCanada’s Westborough office, eighty activists with the Tar Sands Blockade in Texas were occupying TransCanada’s office in Houston, and thousands of indigenous Canadian activists with the Idle No More movement continued their fight to defend their water and land from tar sands development. Soon, New England will see region-wide actions protesting ExxonMobil’s plan to transport tar sands oil from Canada across Vermont and New Hampshire to Portland, Maine. And across the country, college students have launched campaigns on more than 200 campuses demanding that their schools divest from fossil fuels. Nearly half a century after Dr. King’s death, my generation’s position may look hopeless. But more and more of us are finding the will to fight nonviolently for our future. We will fight on our campuses, on the streets, and even in the offices of the corporations who would willingly sacrifice lives for profits. We will continue to call for climate justice—because the arc of the moral universe bends towards justice, and because we have no other choice.